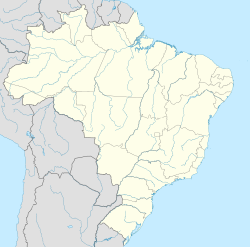 For other uses, see Campo Grande (disambiguation). 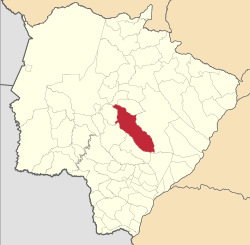 Campo Grande (Brazilian Portuguese: [ˈkɐ̃pu ˈɡɾɐ̃dʒi], Great Field) is the capital and largest city of the Brazilian state of Mato Grosso do Sul in the Center-West region of the country. The city is nicknamed Cidade Morena ("Swarthy City" in Portuguese) because of the reddish-brown colour of the region's soil. It has a population of 796,252, according to a 2011 IBGE estimate, while its metropolitan area is home to 991,420 people (2010). Campo Grande has a tropical savanna climate (Köppen: Aw), with a mild appearance of cold air masses on the southern edge of the tropics. It has semi-humid, hot summers, and notably seasonal, with a dry winter season from June through September, but without major irregularities. in the precipitation. Its altitude a few hundred meters higher than in the surrounding swamps and its location in the interior of South America, gives a much more extreme climate than several Brazilian cities, although still moderate. In addition, the flood is one of the problems seen in the city, the result of intense rains that occur in a short period. Annual rainfall averages 1,465 millimetres (57.7 in). January is the warmest and rainiest month, with mean highs of 29 °C (84.2 °F) and lows of 20 °C (68.0 °F). Per capita income was R$24.839 in 2013 (about of US$11,511). ^ The European Portuguese pronunciation is [ˈkɐ̃pu ˈɣɾɐ̃d(ɨ)]. ^ "Estimativas demográficas em municipalidades brasileiras" [Population estimates in Brazilian municipalities]. July 1, 2011. p. 120. Archived from the original (PDF) on August 31, 2011. ^ "Análise das precipitações em alguns municípios de Mato Grosso do Sul" (PDF). ^ "Campo Grande climate: Average Temperature, weather by month, Campo Grande weather averages - Climate-Data.org". en.climate-data.org. Retrieved 2019-02-19. ^ Sant’Anna Neto, João Lima; Andrade, Vicentina Socorro da Anunciação (2012). "Extremo climático e riscos na cidade de Campo Grande-MS/Brasil". Territorium: Revista Portuguesa de riscos, prevenção e segurança (19): 33–42. doi:10.14195/1647-7723_19_4. ISSN 1647-7723. ^ "World Weather Information Service - Campo Grande". World Meteorological Organization. Retrieved May 6, 2014. ^ "Campo Grande Climate Normals 1961–1990". National Oceanic and Atmospheric Administration. Retrieved May 6, 2014. ^ "Weatherbase: Historical Weather for Campo Grande". Weatherbase. Retrieved May 6, 2014. ^ GDP (in Portuguese). Campo Grande, Brazil: IBGE. 2013. ^ IBGE (in Portuguese). Campo Grande, Brazil: IBGE. 2013. ^ "Em comemoração aos 37 anos de MS, Volta das Nações atrai multidão". www.voltadasnacoes.ms.sesi.org.br/. Archived from the original on 21 January 2015. Retrieved 21 January 2015.